In this article, first published in British Journal for the History of Science in 1996 and reproduced here by kind permission of the author, Bruce J. Hunt provides a detailed examination of Whitehouse's role in early cable telegraphy. Professor Hunt is a member of the faculty of the Department of History, University of Texas, Austin, Texas 78712, USA. Between 1856 and 1858, a group of entrepreneurs and engineers led by the American Cyrus Field and the Englishmen J. W. Brett, Charles Bright and E. O. Wildman Whitehouse sought to lay a telegraph cable across the Atlantic from Ireland to Newfoundland. Their projected cable would be far longer, far more expensive, and far more difficult to lay than any previously attempted; that such an ambitious undertaking was launched and quickly drew financial backing was testimony to the technological enthusiasm of the mid-Victorian era. After many setbacks, the cable was successfully completed early in August 1858. The first messages it carried were met with rapturous excitement on both sides of the Atlantic — making its failure after just a few weeks of fitful service all the more humiliating. Identifying the causes of that failure, and assigning blame for them, became crucial to ensuring the future of transoceanic cable telegraphy. Were the causes of the failure intrinsic to the enterprise, and the vision of a network of transoceanic cables no more than an unrealistic dream? Or did the collapse of the cable result simply from a series of unfortunate and correctable errors ? How those questions were answered in the autumn of 1858 would go far toward determining the prospects not only for renewing the Atlantic project, but also for any attempt to extend submarine cables more widely around the world. In the seven years since the first successful cable had been laid across the English Channel in 1851, submarine telegraphy had already grown into a large and important business. Along with the web of landlines that had been spreading rapidly since the early 1840s, the cables that linked Britain to France, Belgium, Holland and Ireland and that crossed parts of the Mediterranean and Black Seas had begun to transform the dissemination of news, the conduct of diplomacy and, most importantly, the operation of international markets. 1. On the first Atlantic cable, see the accounts in Charles Bright, Submarine Telegraphs, Their History, Construction, and Working, London, 1898, 38-54; Silvanus P. Thompson, The Life of William Thomson, Baron Kelvin of Largs, 2 vols., London, 1911, i, 325-96; Bern Dibner, The Atlantic Cable, Norwalk, 1959, 5-45; and Crosbie Smith and M. Norton Wise, Energy and Empire: A Biographical Study of Lord Kelvin, Cambridge, 1989, 667-75. 2. On the economic and political effects of cable telegraphy, see Daniel R. Headrick, The Invisible Weapon: Telecommunications and International Politics, 1851-1945, Oxford, 1991; and Vary T. Coates and Bernard S. Finn, A Retrospective Technology Assessment: Submarine Telegraphy — The Transatlantic Cables of 1866, San Francisco, 1979. Telegraphy — particularly cable telegraphy, with its more complex transmission conditions and greater need for precision and reliability — had also begun to shape work in electrical science, providing new demands and opportunities for research and focusing attention on a new range of electrical phenomena. All of these influences were later to grow enormously. By the mid-1870s, submarine cables not only spanned the Atlantic but also linked Europe to India, Australia and East Asia; they would soon ring the coasts of Africa and South America as well. Almost all of these cables were built, laid and operated by British firms, and the growing global cable network was widely recognized as a major bulwark of British commercial and imperial power in the late nineteenth and early twentieth centuries. At the end of the 1850s, however, that future hung in the balance. In the wake of the failure of the Atlantic cable in 1858 and the costly collapse of the British government-backed Red Sea cable a year later, transoceanic cable telegraphy looked to many like a great failed technology. The early backers of submarine telegraphy saw that before they could hope to make their grand plans come true they must find a way to explain, or explain away, the failure of the Atlantic cable — preferably in a manner that left their own reputations as unscathed as possible. Even before the 1858 cable had fallen completely silent, blame for its failure had begun to settle on Wildman Whitehouse (1816-90), the ‘electrician-projector’ of the Atlantic Telegraph Company. In mid-August he was dismissed from the company he had helped to found and denounced by its officials as a fool, a fraud, or both. He was replaced (though too late to save the cable) by the Glasgow professor of natural philosophy William Thomson (later Lord Kelvin), who was later knighted for his role in laying the successful Atlantic cables of 1865-66 and came to be revered for his great scientific contributions to British cable telegraphy. In light of his replacement by Thomson, Whitehouse’s dismissal has often been seen as a chapter in the long struggle between ‘practical men’ and ‘scientists’ for control of the new electrical technology, with Whitehouse depicted as the practical man to Thomson’s scientist. But while the conflict between scientists and practical men was real enough, especially in the latter part of the nineteenth century, we should recognize that it does not tell the whole story, and that some of the main players in the Victorian electrical world did not fall neatly into either camp. In particular, Whitehouse was not really a ‘practical man’ in the usual sense at all. He had none of the experience of building or running a telegraph system that marked such men as Latimer Clark, Charles Bright and Cromwell Varley, and, as we shall see, these true practical men did not regard him as ‘one of them’. Nor was Whitehouse regarded, by himself or others, as a natural philosopher or ‘man of science’ in the same sense as were, say, Michael Faraday or Thomson. He lay outside both groups, in what he eventually found to be an exposed and vulnerable position. After rising rapidly to the top of the electrical world, Whitehouse fell even more abruptly to the bottom. An examination of the short, steep arc of his telegraphic career will illuminate some important points about the ways credibility could be achieved and destroyed among Victorian scientists and engineers. What marked Whitehouse off most distinctly from both scientists and engineers was his attitude toward and practice of measurement. He was not a rule of thumb practitioner — the sort who, like Charlton Wollaston, the engineer on the first Channel cable, sometimes used his tongue to test for the flow of current. Whitehouse was an avid though unorthodox electrical measurer, and invented several novel measuring instruments — notably the ‘magneto-electrometer’, or electromagnetic steelyard, discussed below. But it was not always clear just what Whitehouse’s instruments really measured or how their readings related to those given by more orthodox instruments. Although he worked closely for some time with Bright and others on the practical side, and with Thomson on the scientific side, Whitehouse never took up and assimilated the approach to electrical measurement followed by either the practical men or the scientists (two approaches that were rapidly converging by the late 1850s and early 1860s). Partly as a result, he found himself out of step with both of these important groups, and when his own efforts began to come up short in the months surrounding the disastrous failure of the Atlantic cable in 1858 he found himself without allies. He had no way to connect his own results to other work that was accepted as credible, and when blame came to be assigned in the wake of the failure he was saddled with perhaps even more than his proper share (which was considerable). It was as much his failure to make himself either a scientist or a practical man — to win acceptance as a member of one group or the other — as the actual content of his electrical work that led to Whitehouse’s quick expulsion from the electrical world. 3. Bruce J. Hunt, ‘Michael Faraday, cable telegraphy and the rise of field theory ‘, History of Technology (1991), 13, 1-19. 4. For a characterization of Whitehouse as a ‘practical man’, see, for example, Smith and Wise, op. cit. (1), 664, 676. On the conflict between scientists and practical men later in the century, see Bruce J. Hunt, ‘“Practice vs. theory”: the British electrical debate, 1888-1891’, Isis (1983), 74, 341-55; on its eventual partial resolution, see Sungook Hong, ‘Forging electrical engineering: John Ambrose Fleming and the Ferranti effect’, Isis (1995), 86, 30-51, especially 50-1. 5. See Bright, op. cit. (1), 6n. By training and background, Edward Orange Wildman Whitehouse was neither an engineer nor a scientist, but a surgeon. He had a large and lucrative practice at Brighton when, in the early 1850s, at the age of about 35, he began to experiment with electricity. His efforts to devise a new multi-wire telegraph soon brought him into contact with J. W. Brett, the entrepreneur behind the first Channel cable. Brett later said he saw in Whitehouse ‘most patient qualities of investigation’, and it was apparently at his suggestion that, in 1854-55, Whitehouse began to study the troubling phenomenon of ‘retardation’. This delay and blurring together of signals — so that crisp and clear pulses sent in one end of a line emerged at the other stretched out and jumbled together, necessitating slower sending to keep the message readable — had recently begun to turn up on long underground lines and submarine cables and threatened to pose a serious obstacle to Brett’s great dream of a transatlantic cable. In the spring of 1855, Brett gave Whitehouse access to two multi-conductor cables being readied for shipment, containing a total of about 1125 miles of wire. Whitehouse proceeded to perform virtually every experiment he could think of on these cables, hoping, as he later said, either to prove the practicability of long-distance submarine telegraphy, or at least to ‘make us better acquainted with the electrical difficulties to be encountered, and so place us in a position to meet the enemy with the true indomitable English spirit, — determined to conquer’. Whitehouse described his experiments to the Mathematical and Physical Section of the British Association at its 1855 Glasgow meeting. It was his first scientific paper and he clearly took great pains with it, even having it printed as a pamphlet. He first sought to justify himself before his audience — to explain why he, a surgeon with neither scientific credentials nor practical experience, should be taken seriously when speaking on cable telegraphy. He opened his paper by declaring that ‘The study of the varied phenomena of Electricity is no longer the exclusive privilege of the philosopher’; the recent spread of telegraphy had, he said, opened the subject far more widely, so that even one ‘unknown in the world of science’ might now venture to record his electrical experiments and observations. Whitehouse clearly sought to shift any claim to scientific credibility away from himself (for he knew he had little) and onto the ‘matters of fact’ he was able to produce experimentally, while justifying his own involvement in the field by citing its great practical importance. Whitehouse was unknown, however, not just in the world of science, but in the world of practice as well. With no experience on lines or cables in actual use, he had no real standing among the emerging community of telegraph engineers. The ‘matters of fact’ he could present for consideration were the products of special experiments, not of practical experience. He evidently concluded that in these circumstances his best hope of achieving some standing in the electrical world, and of contributing to the advancement of submarine telegraphy, lay in presenting himself as neither a ‘philosopher’ nor a practical engineer, but as a Baconian experimenter whose findings might aid practical progress. In his 1855 paper Whitehouse explicitly disavowed the role of the disinterested natural philosopher, asking that, in light of the importance of cable telegraphy, he be ‘pardoned’ for having ‘investigated the phenomena exhibited by electrical currents in subterranean and submarine wires, as a speciality, and with a direct leaning towards their practical application, rather than in their more general and more extended theoretical aspects’. 6. Among the few extant obituaries and biographical notices of Whitehouse, see the brief ‘Obituary Notice’ in the Electrician (1890), 24, 319; the entry in the 1865 and 1879 editions of Routledge’s Men of the Time; and the entry in J. C. Poggendorff ‘s Biographisch-Literarisches Handwörterbuch zur Geschichte der Exacten Wissenschaften, Leipzig, 1898, iii, pt 2, 1438. Whitehouse’s approach to electrical experimentation paralleled in many ways that of the ‘electricians’ of the 1830s and early 1840s discussed in Iwan Rhys Morus, ‘Currents from the underworld: electricity and the technology of display in early Victorian England’, Isis (193), 84, 50-69, but I have found no evidence linking Whitehouse directly to the earlier group. 7. See Whitehouse’s testimony, 15 December 1859, in Report of the Joint Committee on the Construction of Submarine Telegraphs, British Parliamentary Papers, 1860, LXII, London, 1861, 69; J. W. Brett, ‘Atlantic telegraph’ (letter), Engineer (8 October 1858), 6, 267; and E. O. Wildman Whitehouse, The Atlantic Telegraph — The Rise, Progress, and Development of its Electrical Department, London, 1858, 6, also published in Engineer (24 September 1858), 6, 230-2. On the discovery and early study of retardation, see Hunt, op. cit. (3). 8. E. O. Wildman Whitehouse, Report on a Series of Experimental Observations on Two Lengths of Submarine Electric Cable, Containing, in the Aggregate, 1,125 Miles of Wire, Being the Substance of a Paper Read Before the British Association for the Advancement of Science, at Glasgow, Sept. 14th, 1855, Brighton, 1855, 6. A copy of this rare, privately printed work, inscribed ‘March 4, 1856 Sam. F. B. Morse from Cyrus W. Field, Esq.’, is in the Olin Library at Cornell University. A report of the paper was published in Athenaeum (22 September 1855), 1091-2, and a brief abstract appeared under the title ‘Experimental observations on an electric cable’ in the 1855 British Association Report, Section A, 23-4; excerpts were published in ‘The Atlantic telegraph’, Engineer (30 January 1857), 3, 82-3. 9. Whitehouse, Report, op. cit. (8), 3. 10. Whitehouse, Report, op. cit. (8), 5. Whitehouse gave a fairly straightforward account of his experiments at the Glasgow meeting. His basic technique was to send trains of pulses through a cable and, at the far end, record the resulting currents electrochemically on a moving paper tape. This yielded what he called ‘the handwriting, the autograph, of the current itself’ and gave him a seemingly objective way to ‘observe its habits and behaviour’, particularly the amount of delay and stretching due to retardation, as he varied the length of cable used and the power and nature of the pulses sent. He found, among much else, that strong alternating pulses from a magneto-electric generator showed much less retardation than did the usual battery currents — indeed, with such magneto pulses, signalling speeds ‘ample for commercial success’ could, he said, be achieved through the full 1125 miles of wire. Moreover, he found that ‘doubling or trebling the mass of conducting metals’ carrying the current (by sending it simultaneously along two or three of the separately insulated wires within the cable, not by using a single larger wire) did not reduce the retardation, so that ‘no adequate advantage would be gained by any considerable increase in the size of the wire’. In short, Whitehouse found that retardation did not pose as serious an obstacle to submarine telegraphy as had been feared, and he was clearly happy to be able to conclude ‘that India, Australia, and America are readily accessible by telegraph without the use of wires larger than those now commonly employed in submarine cables’. This was just what promoters of an Atlantic cable wanted to hear, of course, and through Brett, Whitehouse soon came into contact with Cyrus Field, the American entrepreneur who was spearheading the effort. Whitehouse evidently made a strong impression on Field; Brett later said it was at Field’s insistence that Whitehouse was brought into the project and, in October 1856, joined Field, Brett and the young but experienced telegraph engineer Charles Bright as one of the original ‘projectors’ of the proposed Atlantic Telegraph Company. Whitehouse’s favourable experimental results made him a valuable asset in the campaign to convince potential investors of the feasibility of the proposed cable, and it was on the strength of those results, rather than any practical experience, that he was named the ‘electrician ‘of the new company. 11. Whitehouse, Report, op. cit. (8), 10-11. Whitehouse gave a fuller account of his methods (with illustrations) in ‘Experiments on the retardation of electric signals, observed in submarine conductors ‘, Engineer (23 January 1857), 3, 62-3. 12. Whitehouse, Report, op. cit. (8), 21. 13. Whitehouse, ‘Experimental observations’, op. cit. (8), 24, and Report, op. cit. (8), 20. 14. Whitehouse, Report, op. cit. (8), 22. 15. Field was certainly aware of Whitehouse’s work by March 1856, when he sent Morse a copy of Whitehouse’s 1855 Glasgow paper; see note 8, above. 16. Brett, op. cit. (7), 267 ; Bright, op. cit. (1), 28. Field, Brett and Charles Bright joined together on 29 September 1856 as the initial ‘projectors’ of the company; Whitehouse was added as an equal member of the group a short time later, before legal registration of the Atlantic Telegraph Company on 20 October 1856. One of the main threats to investors’ confidence in the project continued to be fear that retardation would render signalling over such a distance impossible, or at least too slow to be profitable. That fear had been strengthened in May 1855 when Thomson published his ‘Theory of the electric telegraph’, in which he showed that the retardation on a cable depended on the product of its total resistance and capacitance and so increased with the square of its length.But this paper was too mathematical for most telegraph engineers or potential cable investors to follow, and a remark Thomson made in an 1855 British Association paper on what he called ‘peristaltic induction’ did more to draw their attention to his views. Citing the difficulties that had beset the 300 mile Black Sea cable which the British government had ordered earlier that year to provide communications during the Crimean War, he noted that, according to his theory, a cable of the same thickness but six times as long (long enough to span the Atlantic) would give thirty-six times the retardation, and thirty-six times the slowness of action’ ; by the same token, a cable that long would have to be six times as thick to match even the rather slow rate of signalling achieved on the Black Sea cable. Thomson’s remark was perhaps a bit hasty, since it was far from clear that retardation was the real cause of the slowness of the Black Sea cable (poorly adjusted sending and receiving instruments seem to have been the main culprits), but such a statement, backed as it was by Thomson’s sophisticated theoretical reasoning and high scientific authority, helped stoke serious doubts about the feasibility of the proposed Atlantic cable. Whitehouse attacked this threat head on at the August 1856 Cheltenham meeting of the British Association. In a paper provocatively entitled The law of squares — is it applicable or not to the transmission of signals in submarine circuits ?’, he piled up experimental results, some new and some dating from the year before, all tending to contradict what he called Thomson’s law of squares’. Measurements of battery currents that had passed through lengths of cable ranging from 83 to 1020 miles showed, he said, that the retardation increased not with the square of the length, but ‘very little beyond the simple arithmetical ratio’. Increasing the size of the conductor (by using two or three separately insulated wires, rather than a single thicker wire) actually increased the retardation, in direct contradiction to Thomson’s ‘law’. Finally, in what he called an experimentum crucis’ , Whitehouse found that doubling the length of a cable from 500 to over 1000 miles did not drop the number of distinct signals it could pass per unit time from 350 to fewer than 90, as Thomson’s law predicted, but only from 350 to 270. Thomson’s purported ‘law’, Whitehouse declared, was no more than a fiction of the schools’ and could be safely ignored in the design and construction of submarine cables. 17. William Thomson, ‘On the theory of the electric telegraph’, Proceedings of the Royal Society of London (1855), 7, 382-99, reprinted in Thomson, Mathematical and Physical Papers, 6 vols., Cambridge, 1884, ii, 61-76, hereinafter cited as MPP. 18. William Thomson, ‘On peristaltic induction of electric currents in submarine telegraph wires’, British Association Report (1855), Section A, 22, reprinted in Thomson, MPP, op. cit. (17), ii, 77-8. 19. E. O. Wildman Whitehouse, ‘The law of squares — is it applicable or not to the transmission of signals in submarine circuits ?’, British Association Report (1856), 21-3; also published in Athenaeum (30 August 1856), 1092. Whitehouse’s aim was clear: he wanted to protect the Atlantic cable project from a theory that made it appear doomed to failure. Careers, reputations and huge sums of money were riding on who was right about the law of squares. But how could Whitehouse, a surgeon who had only recently, in his own words, begun dabbling in science’, hope to challenge the authority of Thomson and the body of established science that stood behind him? As in 1855, Whitehouse sought to shift any claim to scientific credibility from himself to his measurements, and at the 1856 British Association meeting he offered to repeat his experiments ‘before a committee of this Section in London, if the important nature of the subject should seem to render such a course desirable’. Conversely, how could Thomson, who had as yet done far fewer experiments on telegraph cables than Whitehouse had, challenge the authority of Whitehouse’s measurements, which appeared to constitute verifiable matters of fact? In the autumn of 1856, Thomson faced a difficult task. He responded by, in effect, stripping Whitehouse’s experiments down to their essentials and then reinterpreting and further explicating his own theory in such a way that he could claim that Whitehouse’s experiments were in fact quite consistent with that theory — when both were properly understood. All of this was thrashed out in the pages of the Athenaeum in October and November 1856. Thomson argued that Whitehouse had not connected Thomson’s theory to his own measurements in the right way — that what Whitehouse had so meticulously measured was not quite what Thomson had been talking about. In particular, Thomson pointed out that with the inconstant batteries and relatively heavy magnetic receiving instruments Whitehouse had used one would, on Thomson’s theory, expect deviations from the simple law of squares similar to those Whitehouse had in fact observed, and that his claim that the use of thicker wires would reduce the amount of retardation had not been properly tested by Whitehouse’s experiments with multiple separately insulated wires. In short, Thomson found ways to hold onto his theory without robbing Whitehouse of his experiments, or even of the main practical conclusions he had sought to draw from them. Indeed, Thomson said that there was now good reason to believe that the slowness of the Black Sea cable had been mainly due to bad receiving instruments, not retardation, so that there was a realistic hope of being able to signal at a profitable rate through an Atlantic cable of ordinary thickness — just as Whitehouse had been arguing since 1855. Whitehouse was quite happy to let Thomson go on ‘maintaining the correctness of his theory — as theory’ since, as he noted, it seemed that ‘the whole position for which I originally contended is conceded by Prof. Thomson’. Late in 1856, he visited Glasgow and showed Thomson some of his apparatus and experiments; the two soon became quite friendly. By December 1856 — about the time he was being elected to the board of the new Atlantic Telegraph Company — Thomson was praising Whitehouse’s ‘long and careful investigations’ and saying that ‘nothing can be more perfect than the agreement of these experimental results’, when properly interpreted, with Thomson’s own propagation theory; by January 1857 he was publicly declaring that his previous theoretical objections had now all been met and that Whitehouse’s signalling system promised to give excellent results on the Atlantic cable; by September he was describing the workings of Whitehouse’s patented relay and induction coils in glowing terms at the British Association; and by November he was asking how he might go about proposing Whitehouse for election to the Royal Society. To say that Whitehouse and Thomson had patched up their differences would evidently be an understatement; but that was not quite the end of the story. 20. Whitehouse, Atlantic Telegraph, op. cit. (7), 6. 21. Whitehouse, op. cit. (19), 21. No such committee was ever formed. 22. See the letters from William Thomson, ‘Telegraphs to America’, Athenaeum (4 October 1856,1219, and 1 November 1856, 1338-9), and E. O. Wildman Whitehouse, ‘The Atlantic telegraph’, Athenaeum (11 October 1856, 1247; and 8 November 1856, 1371), and the discussion in Smith and Wise, op. cit. (1), 661-4. 23. Thomson, 1 November 1856, op. cit. (22), 1338-9. 24. Whitehouse, 8 November 1856, op. cit. (22), 1371. 25. William Thomson to Auguste de la Rive, 17 December 1856, in Paul Tunbridge, Lord Kelvin: His Influence on Electrical Measurements and Units, London, 1992, 97; William Thomson, in discussion of F. R. Window, Submarine telegraphs ‘, Proceedings of the Institution of Civil Engineers (13 January 1857), 16, 210-11; William Thomson, ‘On Mr. Whitehouse’s relay and induction coils in action on short circuit’, British Association Report (1857), 21; William Thomson to G. G. Stokes, 7 November 1857, in Correspondence between Sir George Gabriel Stokes and Sir William Thomson, Baron Kelvin of Largs (ed. D. B. Wilson), 2 vols., Cambridge, 1990, i, 226. Thomson had taken up James Joule in a similar way in the late 1840s, but with very different eventual results. Before returning to the course of the Atlantic cable project itself, let us look more closely at Whitehouse’s activity as a measurer. Measurements and measuring instruments played an important part in his work; it was, after all, on experimental measurements, not theoretical prowess or practical experience, that he had based his claim to credibility. Moreover, he had found, he said, that ‘the observation of new phenomena ...required the construction of new instruments of research fitted for the especial purpose of their examination’, and the way he thought about electrical phenomena was always closely bound up with the special instruments he used to study them. 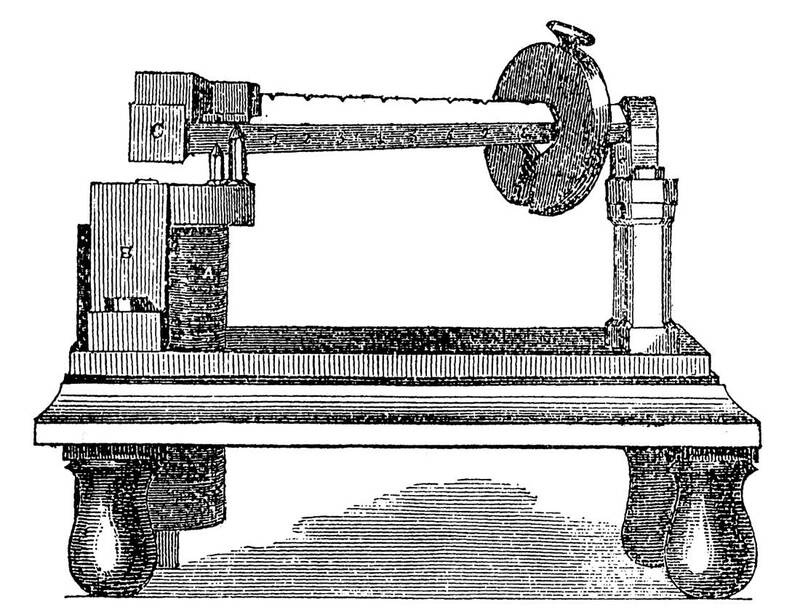 The most important and distinctive of these instruments was Whitehouse’s ‘magneto- electrometer ‘or electromagnetic steelyard, which he mentioned briefly in his 1855 paper and described more fully in 1856 at the British Association and in the Engineer He devised this instrument to measure the strength of pulses of current too brief to produce a steady deflection on an ordinary galvanometer. It consisted of an electromagnet mounted in a strong frame on which was balanced a lever bearing a soft iron keeper on one end and a movable weight on the other (Figure 1). When a pulse of current was led into the coils of the electromagnet, it generated, Whitehouse said, an amount of magnetism ‘strictly proportional to its own proper energy’. The resulting magnetic force pulled down on the iron keeper and either lifted or did not lift the weight on the long arm of the lever. Whitehouse regarded the maximum weight lifted as the best measure of the strength of a pulse of current, or ‘of what I propose to call its “ value ” in telegraphy’. His magneto- electrometer was, he claimed, so delicate that it could measure the ‘value’ of a current ‘too feeble in its energy, too brief in its duration, to give the slightest indication’ on a sensitive galvanometer, yet so robust that it could accurately ‘weigh ‘currents over a range from less than one grain to more than half a million (that is, from about a thousandth of an ounce to nearly 100 pounds). It is only necessary to see this staid and business-like instrument at work by the side of the old ecstatic, as well as astatic needle, to comprehend its superiority at a glance. The one piece of apparatus tossing so wildly and crazily about, that for minutes at a time the most patient and skilful observer can make neither head nor tail of its bewildering movements; the other piece quietly tilting up its weight on the end of the steelyard, and refusing in the most self-possessed way to lift another grain under any inducement that can be brought to bear, and then sending in its refusal as the exact estimate of the force it has been commissioned to determine. Where the galvanometer was ‘hysterical’, Whitehouse’s magneto-electrometer was ‘staid’ ; where the galvanometer was ‘ecstatic’, his little steelyard was ‘business-like’. Whitehouse’s device was presented as embodying all of the values (‘manly’ values, at that) likely to appeal to either a scientist or a practical man, and as the perfect instrument for producing solid matters of experimental fact. 26. Whitehouse, Atlantic Telegraph, op. cit. (7), 6. 27. Whitehouse, Report, op. cit. (8), 22, and ‘On the construction and use of an instrument for determining the value of intermittent or alternating electric currents for purposes of practical telegraphy ‘, Engineer (26 September 1856), 2, 523; abstract in British Association Report (1856), 19-21. 28. Whitehouse, ‘On the construction’, op. cit. (27), 523. 29. Whitehouse, Report, op. cit. (8), 22, and ‘On the construction’, op. cit. (27), 523. 30. R. J. M., The Atlantic Telegraph — A History of Preliminary Experimental Proceedings, and a Descriptive Account of the Present State and Prospects of the Undertaking, London, 1857. The author of this 69-page pamphlet is identified as R. J. Mann in Dibner, Atlantic Cable, op. cit. (1), 95. Although Whitehouse was widely believed to have been its author — no doubt because it praised him so lavishly — he later said he had only given advice to the ‘talented popular writer’ hired to write it; see Whitehouse, ‘The Atlantic telegraph’ (letter), Engineer (26 November 1858), 6, 410. Whitehouse used his magneto-electrometer (and his moving-tape indicator) in his studies of pulse transmission and his test of the law of squares. The new instrument enabled him to measure the ‘value ‘of currents passing through different lengths of cable under varying conditions and, he said, ‘to ascertain with certainty and minute accuracy the loss due to the combined effect of resistance, induction, and defective insulation’. Moreover, he argued that the ‘value ‘of a current as measured by his magneto-electrometer bore a more direct relation to the needs of telegraphy than did the readings of a galvanometer or other ordinary electrical instrument; ‘unlike the degrees upon the galvanometer’, he said, ‘these grains of force are units of real value and of practical utility’. In fact, however, it was not clear how the ‘values’ measured by the magneto- electrometer related to the operation of actual telegraph receivers (besides Whitehouse’s own patented relays, which operated on similar principles), or to the scientists’ key electrical quantities of ‘tension ‘(voltage) and ‘quantity ‘(current). Indeed, the two quantities seemed to be mixed together in the readings of Whitehouse’s instrument, and further obscured by the effects of the high inductance and relatively slow response of its large coils and heavy iron cores. Whitehouse had laid down the principle that, to be practically useful, electrical data ‘should be obtained by the use of instruments either identical or strictly comparable with those that will afterwards be employed in the telegraphic use of the wire’. He followed this principle himself, and his own induction coils for transmitting signals and relays for receiving them were closely integrated with his magneto-electrometer and other measuring instruments. But Whitehouse was in danger of building up a self-contained system of measurement and signalling techniques that did not link up with the methods and instruments used by others. As Thomson later noted in discussing Whitehouse’s reluctance to use standard resistance coils for cable tests, ‘the electrician of the company had his own system of testing which he considered satisfactory’. This was fine as long as Whitehouse was seeking only to satisfy himself, but his insistence on pursuing idiosyncratic methods made it difficult to connect his results with others’ and so tie them into a secure network of credibility. Whitehouse seems to have realized, in anticipation of Bruno Latour’s recent dicta on replication and standardization, that he might avoid such isolation by multiplying his standard — by making magneto- electrometers exactly like his own the common property of telegraph researchers. Recognizing that ‘it is necessary to have one common standard of comparison, to which all instruments so made may be adjusted’, he offered ‘to set aside for this special purpose the most accurately-finished and perfect instrument I can obtain, with which I will be most happy at all times to compare those of any of my fellow-labourers in the field’. But the offer was not taken up before his abrupt fall from favour two years later, and Whitehouse’s instruments and measuring practices remained his alone. 31. Whitehouse, ‘On the construction’, op. cit. (27), 523. 32. Whitehouse, 8 November 1856, op. cit. (22), 1371. 33. Thomson’s testimony, 17 December 1859, in Report of the Joint Committee, op. cit. (7), 115. 34. Whitehouse, ‘On the construction ‘, op. cit. (27), 523. On standardization, replication and networks of credibility, see Bruno Latour, Science in Action, Cambridge, MA, 1987, especially 247-57, and Joseph O’Connell, ‘Metrology: the creation of universality by the circulation of particulars ‘, Social Studies of Science (1993), 23, 129-73. Work on the Atlantic cable went ahead at a furious pace through the first half of 1857 as Field pushed relentlessly for the cable to be laid that summer. As much as £13,000 was spent on Whitehouse’s special patented instruments and apparatus, including relays, special batteries and 5-foot induction coils, and on testing the cable as it was being manufactured and prepared for shipment, though Whitehouse later complained that he was not given time to test it as thoroughly as he would have liked. The story of the cable expeditions of 1857 and 1858 has been told many times; here we will focus on a few points bearing on Whitehouse’s role. Health problems kept him from accompanying either of the abortive attempts made in August 1857, his place on board being filled both times, and on all four voyages in 1858, by Thomson in his capacity as a director of the company. This no doubt tended to erode Whitehouse’s authority while augmenting Thomson’s, but Whitehouse retained control of the electrical arrangements through the winter of 1857-58, when he performed additional tests while the cable was in storage at Keyham Docks, Plymouth, and during the renewed attempts to lay the cable in the summer of 1858. When, after three disheartening failures, the cable was finally successfully laid on 5 August 1858, the Irish end at Valentia was turned over to Whitehouse and the Newfoundland end at Trinity Bay to his assistant, C.V. de Sauty. Whitehouse quickly connected up his sending and receiving apparatus and, after some delays, de Sauty did the same in Newfoundland, but it soon became clear that Whitehouse’s induction coils and heavy relays could not give the promised speed and clarity of signalling. Within a few days, Whitehouse took to reading the incoming signals on Thomson’s delicate mirror galvanometer, though he continued to claim he was receiving them on his own relays. (De Sauty continued to use only Whitehouse’s relays, and so was able to receive only very slowly — it took over 16 hours for him to receive the 99-word message from the Queen to the American President James Buchanan, compared to only 67 minutes for it to be repeated back and read at Valentia on the mirror galvanometer.) Moreover, the cable itself was deteriorating, as existing small faults in the insulation due to hasty manufacture and rough handling were exacerbated by Whitehouse’s use of huge pulses of current from his 5 foot induction coils. Whitehouse’s relations with the board of directors of the company steadily worsened, too, and after two particularly sharp instances of insubordination on his part (he violated strict orders that he not attempt to underrun the cable in Valentia harbour, and then refused to admit an experienced cable operator the board had sent to look into the difficulties), he was dismissed on 17 August, and control of the Valentia station passed to Thomson. But the cable had already been too badly damaged; despite Thomson’s best efforts to nurse it along, within a few weeks it was dead. Whitehouse’s swan song as an active experimenter came later in September at the Leeds meeting of the British Association, where he read six papers on aspects of his work on the Atlantic cable. After describing his sending and receiving apparatus, recounting his latest experiments on signal velocities, and discussing his methods for locating faults, he presented ‘A Few Thoughts on the Size of Conductors for Submarine Circuits’. He denied having ever asserted that thin cables were best for submarine telegraphy and said he had merely argued, on the basis of his experiments on retardation in multi-wire cables, that the case for using thicker cables was not as clear-cut as was sometimes claimed, and that the whole question of the combined effects of resistance and induction deserved further study. He closed by remarking wistfully that ‘Present leisure from the engrossing details of official duties will, I hope, afford me the opportunity of examining this subject experimentally’. 35. ‘Statement of the Board of Directors of the Atlantic Telegraph Company’, Engineer (8 October 1858), 6, 267-8 ; Thompson, op. cit. (1), i, 370; E. O. Wildman Whitehouse, ‘A brief description of the instruments employed on the opening of the Atlantic Line’, Engineer (29 October 1858), 6, 329. 36. Whitehouse, Atlantic Telegraph, op. cit. (7), 18-22. For more on the 1857-58 expeditions, see the works cited in note 1. D. de Cogan, ‘Dr. E. O. W. Whitehouse and the 1858 trans-Atlantic cable’, History of Technology (1985), 10,1-15, contains some useful information but is marred by several errors. 37. Thompson, op. cit. (1), i, 367-8. 39. Thompson, op. cit. (1), i, 374-7. 40. E. O. Wildman Whitehouse, ‘A few thoughts on the size of conductors for submarine circuits’, Engineer (29 October 1858), 6, 329. All six of the papers Whitehouse read before the Mathematical and Physical Section at Leeds on 28 September 1858 were published in the Engineer, 329-30; one of them, ‘On some of the difficulties in testing submarine cables’, also appeared in Athenaeum (30 October 1858), 553 ; but only the general title, ‘Contributions on the submarine telegraph’, with no text, was given in the British Association Report (1858), 25. After the 1858 debacle, Whitehouse was swiftly ousted from the world of cable telegraphy; except for a stint as a consultant during the laying of the Malta—Alexandria cable in 1861, he never worked in the field again. Besides deserving considerable blame for the failure himself, he made a convenient ‘fall guy’ for those seeking to protect their own reputations and that of the cable industry as a whole; with his idiosyncratic methods and instruments, Whitehouse could be safely thrown overboard without dragging much of orthodox cable telegraphy down with him. It was much safer to put the blame on Whitehouse than to implicate figures more central to the continuing enterprise, such as Cyrus Field, Charles Bright, or the manufacturers of the cable, all of whom, with their haste and lack of proper care, arguably shared at least as much responsibility for the failure. Much of the work of officially discrediting Whitehouse was done by the Joint Committee set up by the British government and the Atlantic Telegraph Company in 1859 to investigate and report on the failure of the cable. As Crosbie Smith and Norton Wise have shown, the committee (chaired by Douglas Galton and including Charles Wheatstone, William Fairbairn, G. P. Bidder, Edwin and Latimer Clark, Cromwell Varley and George Saward) was strongly stacked against Whitehouse, and he was certainly made to look bad in his testimony in December 1859. But the process of writing Whitehouse out of the electrical world, and of defining him as neither a proper scientist nor a true practical man, had in fact begun much earlier. A series of letters in the Engineer toward the end of 1858 had delivered some of the heaviest blows, while bringing out the underlying issues in a clear and forceful way. Whitehouse’s claim at Leeds that he had never said that thin cables were best was not allowed to pass unchallenged, and in early November he was called to account in the letters column of the Engineer by someone who signed himself, significantly, as ‘A Telegraph Engineer and Practical Electrician’. Quoting a quite categorical endorsement of thin cables from the 1857 Atlantic Telegraph Company pamphlet that he (and apparently most others) assumed Whitehouse had written, ‘Telegraph Engineer’ declared that this showed conclusively that Whitehouse had indeed held ‘what is considered by all electricians to be an absurd and ridiculous theory’. Drawing no immediate response, he repeated and extended his attack two weeks later, arguing that Whitehouse had bungled and misunderstood his own experiments on retardation, and that both proper theory and actual experience proved — and ‘our leading practical electricians’ all knew — that thicker cables give less retardation. 41. See the Electrician obituary, op. cit. (6), and Bright, op. cit. (1), 63n. Although Whitehouse was a founding member of the Society of Telegraph Engineers in 1870, he never took an active part in its affairs. 42. Smith and Wise, op. cit. (1), 675-7; Whitehouse’s testimony is in the Report of the Joint Committee, op. cit. (7), 69-82. 43. A Telegraph Engineer and Practical Electrician, ‘The Atlantic telegraph’ (letter), Engineer (5 November 1858), 6, 355. I have not been able to identify the author; the style and content resemble some of Latimer Clark’s writings, but it could have been written by any of a number of other telegraph engineers. 44. A Telegraph Engineer and Practical Electrician, ‘The Atlantic telegraph’ (letter), Engineer (19 November 1858), 6, 391-2. Whitehouse finally responded the next week, denying having authored the 1857 pamphlet and asserting that his statements on retardation and the size of conductors had been widely misunderstood. He renewed his old attack on the law of squares, citing again Thomson’s 1855 remark that an Atlantic cable no thicker than the Black Sea cable would show thirty-six times the retardation, and declaring that this theory-based claim had been roundly refuted not only by his own experiments but by the signalling rates actually achieved on the Atlantic cable. ‘In this manner’, he said, ‘does its brief and barely utilised existence triumphantly confute and set at nought the unnatural constraint to which mere rigid theorists would subject the operations of nature’s laws’ ; ‘men of figures’ were thus again taught, ‘if they would but receive it in a genial manner, that “there are more things in heaven and earth than are dreamt of in their philosophy ”’. Whitehouse’s flirtation with presenting himself as one engaged in ‘philosophical pursuits’ had passed, and he again sought to position himself in opposition to theory-led science and as a follower simply of experiment and practical experience. But telegraph engineers, or at least ‘A Telegraph Engineer’, would have none of it; they were intent on ruling Whitehouse firmly out of the practical camp. ‘When Mr. Whitehouse was high in the counsels of the Atlantic Telegraph Company’, the ‘Telegraph Engineer’ wrote, ‘his erroneous views of the laws of induction and conduction were a source of much concern to practical electricians, because it was [feared] that his ignorance of practical electricity would damage, if not destroy, the grand experiment of ocean telegraphy. Now, however, that he no longer sways the electrical rod in Broad-street, the engineering profession can afford to smile at his fallacious opinions.’ But Britain’s telegraph engineers had a duty to go beyond such private smiles; to protect their professional reputation, they must, ‘Telegraph Engineer’ declared, expose Whitehouse’s errors before the public and make it clear that ‘the profession to which I belong by no means coincide with the wild theories and opinions that have been circulated by him’. Whitehouse had, in effect, to be publicly cast out. ‘Telegraph Engineer’ denied that he was ‘actuated by any personal animosity’ or was connected with any of Whitehouse’s ‘supposed enemies’. ‘I wish simply’, he said, ‘for the credit of the profession to which I have the honour to belong, to let the public, at home and abroad, know that Mr. Whitehouse is not our mouthpiece; that his theories are considered fallacious, and that he is in many respects opposed to the received opinions of our leading practical electricians’. In an especially telling observation — one that points up how important Whitehouse’s measuring practices were in marking him as out of step with both scientists and practical men — ‘Telegraph Engineer’ noted that ‘in the perusal of Mr. Whitehouse’s papers, those most essential and important terms, “quantity”, “intensity”, and “resistance”, are almost... lost sight of. It cannot be that Mr. Whitehouse is ignorant of these properties; but it certainly leads to the opinion that he does not attach sufficient importance to what are considered by all practical electricians as the bone and sinew of the electric current.’ As the measuring practices of electrical scientists and practical men converged in the late 1850s and early 1860s toward a focus on ‘quantity’, ‘intensity’and resistance — as defined in Ohm’s law and reified by embodiment in appropriate standards and measuring instruments — those like Whitehouse who eschewed such quantities and instruments and insisted on defining their own electrical ‘values’found themselves squeezed out. They were excluded, even expelled, from the realms of both science and practice, and left, as Whitehouse soon discovered, with no place to stand in the electrical world then emerging. By publicly casting out Whitehouse, the leaders of the cable industry — both scientists and practical men — were able not only to shed much of their own responsibility for the failure of the Atlantic cable, but to reinforce their joint claim to authority over how, in the future, electrical phenomena were to be measured and understood. 45. Whitehouse, op. cit. (30). 46. Telegraph Engineer, op. cit. (43). The word rendered here as ‘feared’ reads ‘found’ in the original, but this appears to be a mistranscription; Broad Street, in the City of London, was the location of the offices of the Atlantic Telegraph Company. 47. Telegraph Engineer, op. cit. (43). 48. A Telegraph Engineer and Practical Electrician, ‘The Atlantic cable’ (letter), Engineer (3 December 1858), 6, 431. 49. Telegraph Engineer, op. cit. (44), 392. 50. The work of the British Association Committee on Electrical Standards played an especially important role in this process; see Bruce J. Hunt, ‘The ohm is where the art is: British telegraph engineers and the development of electrical standards’, Osiris (1994), 9, 48-63, and Simon Schaffer, ‘Late Victorian metrology and its instrumentation: “A Manufactory of Ohms”’, in Invisible Connections: Instruments, Institutions, and Science (ed. Robert Bud and Susan E. Cozzens), Bellingham, WA, 1992, 23-56.